I have lots to catch you up on, but unfortunately I can’t do it all here today. I need photos remember! I’m participating in Tour De Fleece, which basically means I’m spinning everyday for 2 weeks bar 2 rest days (I took an unplanned rest yesterday shhh). I’m a part of IxChel’s spinning team, and I whilst I picked out three hanks of fibre to spin with, I already feel I’ve deviated from the plan! I have many different fibres of Charly’s that I haven’t even tried and I thought it would make sense to have at least tried them before I embark on another Bendigo Show. 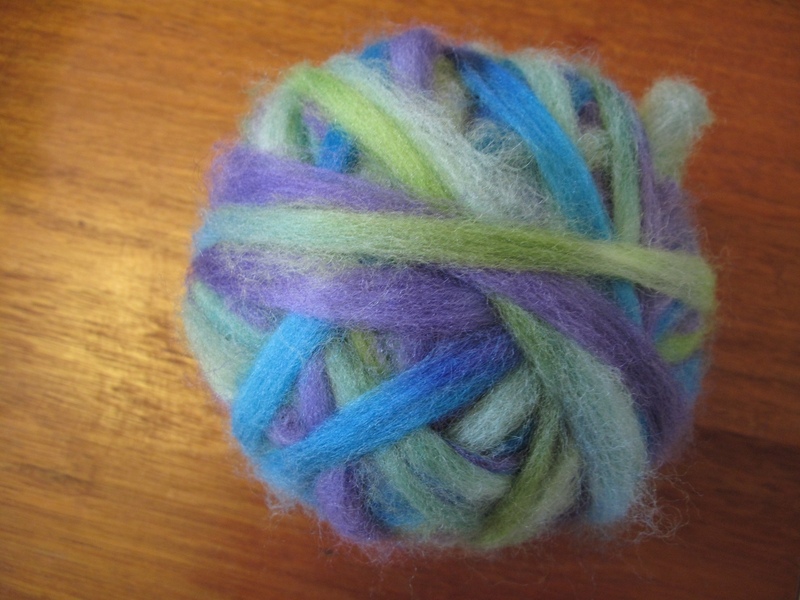 So far I’ve spun (but not plied, I think I’ll leave that to last, or when I run out of bobbins whichever comes first), 100gms of BFL seaweed bunny and 100gms of Cashmere Fling. This morning I began preparing this Navajo Bunny fibre, I stripped it down the most I’ve ever split a braid before to approx 16 sections. And then, there it was, the fibre told me its purpose. I don’t know whether to be happy or sad, I like having frivolous fibre/yarn which serves no purpose up until it is needed! The fibre didn’t whisper, it shouted, damn and I thought I had other plans, oh well. In the new little niece update. She is gorgeous and so far has been the perfect baby for my sister, I’ve seen her once outside of hospital and got a very long cuddle (her head was very heavy!). My sis and her hubby have also been the perfect knitted gift receivers, so I’ve cast on a ‘Snug’, which is a hoody cardigan. A girlfriend at work said cardigans with hoods were the best thing when she had hers. No hat to lose, and when theyre all snuggled up, you pop the hood on and they fall asleep on your shoulder… apparently! I’m hoping to have it done for next weekend in time for another visit.